Behold the face of evil! This is what happens when you avoid rebuilding your WordPress – you play with Photoshop. Behold the face of Cobra Commander! At least, according to the toys. 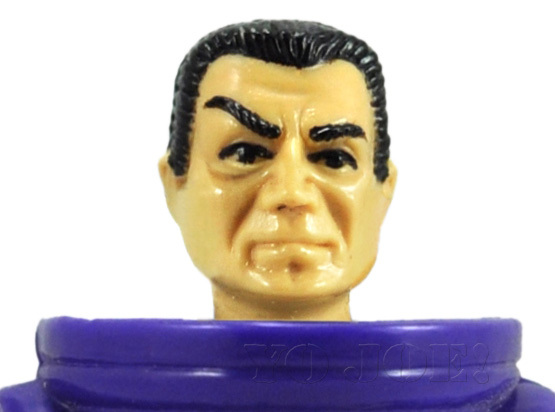 Using the head from Star Brigade Cobra Commander with the face from 1991 Cobra Commander, you can actually get an unobstructed view of his head. I also added in some random G.I. Joe heads just to fill in the gaps. The head is a little stubby on the body, but you know what? It’s a lot better than nothing! Author PhillipPosted on August 29, 2014 August 29, 2014 Categories ToysTags Cobra Commander, G.I. Joe, PhotoshopLeave a comment on Behold the face of evil! For the YoJoe archives, I’ve long wanted to upgrade some of the older comic book pictures. They’re small, a little pixelated, and the colors are off on some of them. I started replacing a few of them today, since something I was working on elsewhere in the site meant I was scanning in a few covers anyways. One of those covers is actually a wraparound, so the front and back covers are one contiguous image. While I can easily scan the front and back images on their own, putting them side by side doesn’t look very good – there’s always some distortion as the page curves towards the spine, and that piece of the image on the spine would be missing anyways. So I tried flattening the spine as best as I could and scanned that. Photoshop has a photomerge feature that can automatically piece multiple images together, but try as I might, it just didn’t look right when I scanned in the three images. I tried scan after scan before giving up and doing it manually. Unfortunately, comic books are stapled in perfect alignment, so I couldn’t just slide the pictures next to each other. It took some time, but I finally got a decent composited image that I was happy to put on the site. I hope everyone gets to see it soon! Over the years, I’ve acquired some G.I. Joe posters and prints. They’re nice pieces of art, but they’re a bit large to display all the time. But what good are they if I can never see them? Well, I decided to change that – I’ve been scanning in these pieces, plus a few miscellaneous others. Of course, they’re larger than my actual scanning screen, so I have to scan in parts at a time. I then piece them together in Photoshop when I’m done. The Photomerge function in Photoshop is a godsend in this respect, though it’s not perfect. I’ve found some pictures with misaligned edges, or straight lines that end up curving. When this happens, it’s back to the old-fashioned way – aligning and cropping by hand. Not the ideal conditions, especially as the colors can be just annoyingly off at times, but I get the job done. I don’t know why I didn’t think of it earlier, but today I finally decided to look up online how to get an all-white background when photographing my toys. Turns out I was doing 90% of the work already, which I suspected. It was that last step that I wasn’t aware about: adjust a slider in the Levels window in Photoshop. Such a simple step that has proven to be immensely powerful. Before, I was spending way too long cutting out the background in a pic by hand. Er, mouse. Now, what took 5 minutes on a good pic takes 5 secs on most any pic. White objects will still require the longer method, but that’s a trade-off I’ll gladly make.